Here are a few screenshots. Took a bit longer to get them due to being out of town. Does this have trans temp in it? 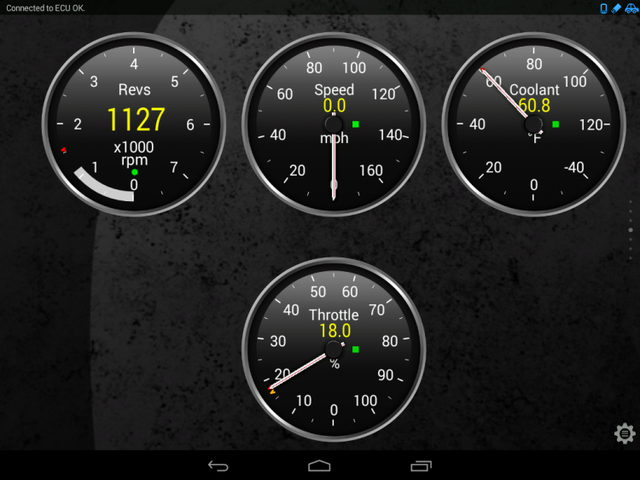 I tried out the free version and got the engine RPM to display but couldn’t find the transmission temp. look for bytes that match expected temps. I tried to pull up the files that were linked earlier in the page but it looks like they disappeared. However I did look at things after a cold start and after a 25 minute highway drive. I went through all other locations in the screenshot and none of the others stuck out as a good fit. My speculation is the 4th row that had a 79 is probably the correct value for transmission temp. However, I don’t know how the locations are defined so that I can pull that into the formula. Can someone explain how the hex locations are defined? to the variable which points to your desired byte. U or V? for 0x79 position. was at AA? AA equaled -1? Does A start in the 2nd row and correspond to 02 in the screenshot? However, you recommend U and V which is different than the N or T that I would try based on my understanding. At least thats my understanding. 18DAF11D are header response bytes. 27 number of data bytes following (hex) ? 622201 response bytes for given pid. FF FF FF (A, B, C). I did some troubleshooting and it looks like it is pulling values much later than what is being explained. Basically I can only choose the last 4 values by using A, B, C or D. anything I can adjust to pull earlier values? Anything beyond D returns a -1, must be due to it going past the end of the data. to see if you get different results. posted by the OP on page . Rx or Nx didn’t seem to work either. Rx didn’t seem to be pulling relevant data that I could tell from anywhere in the stream. Nx matched up with the other method (N0=A…N3=D). What would it mean if I am dealing with an ATH1/0 or ATCAF1/0 issue? I tried to look around at various settings and didn’t see anything that resembled that. Sorry, forgot to upload those yesterday. I didn’t notice much different with the revised string. I’m not sure if I captured what you wanted for two devices near coolant temp and trans temp. If there is something additional needed let me know. Not sure I follow the request. Do you want me to create a gauge for the custom transmission temp PID and include a screenshot of that? I can add a gauge for the custom transmission temp PID but I would expect it to stay at -41.8. 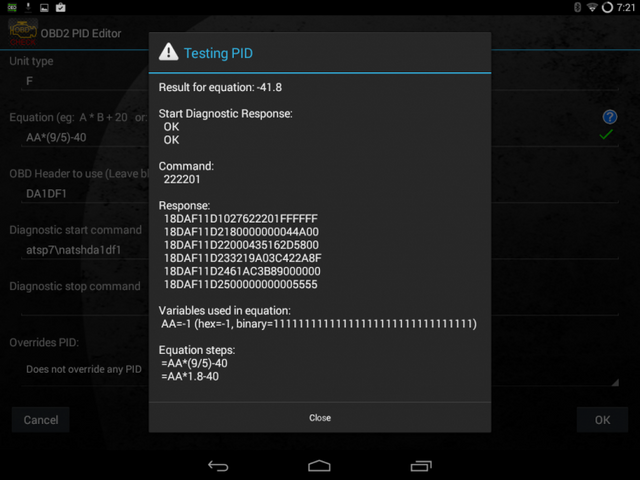 The PID test screenshot was taken when the engine was running. I also looked for the “Oil Temperature A/T” and didn’t see it in the list. I did see two other standard (not custom) PID options for transmission temp PIDs to add to the display. However, neither of those worked and one just appeared to be exactly the same value as coolant temp. format shown on page  but not yours. the multiframe data is presented to Torque. My two cents and as always could be wrong. Page loaded in: 0.124 seconds.